Soup is definitely a staple in our house in winter, for a few reasons – generally, it is cheap to make, it feeds a lot of people, there are leftovers for work the next day, and you can hide a few veggies from the fussy kids! Let’s face it, winter is the time for soup! 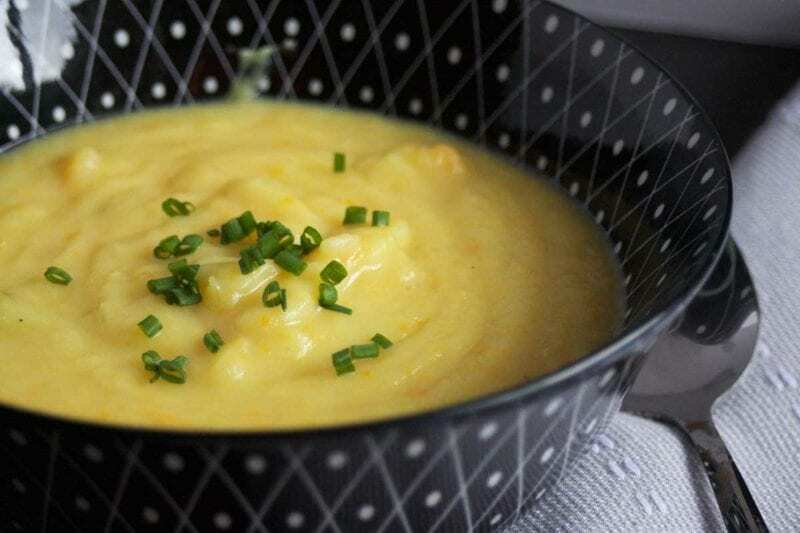 With it coming into winter (currently it is early April in Tassie and there is a chill in the air) it seemed the perfect time to come up with a new soup recipe…creamy potato soup it is! I had never made a potato soup before, so I kinda winged it. I figured it can’t be much different to pumpkin soup, but swap out the pumpkin for potatoes (lol) and it worked out pretty darn perfect. It was tasty, rich and creamy, all the things you want in a soup. Peel the onion and garlic and add to thermie jug. Chop for 3 secs/speed 5. Scrape down sides and add a dash of water. Cook for 3 mins/100ºC/speed 2. While that is cooking, peel the potatoes and cut into large chunks. Also, cut up the celery and carrot. Place these inside the simmering basket and set this in place. Add chicken broth powder and 500g water then cook for 15 mins/steaming temp/speed 2 (MC on). Check to see if the potatoes are cooked, if they need longer cook for a further 5 mins. Once ready, carefully tip the veggies into the jug (with remaining broth mix), add parmesan cheese, sour cream, salt and pepper and puree for 10 secs/speed 6 (turn up slowly as this mix is hot). Serve with extra sour cream, some chives, or even some crunchy bacon bits. Enjoy! Peel and finely dice the onion and garlic. Add to a large pot, bring the heat to medium/hot and saute until onions turn clear. Add a dash of water if the onions are sticking to the pot. Turn the heat down once done. Add all of this to the onions, along with the bone broth powder. Cover with water and bring to the boil, reduce the heat and simmer for 20 mins, or until potatoes are cooked through. Add parmesan cheese, sour cream, salt and pepper and puree with a stick blender, or food processor, till smooth and creamy.